(5) When diagonal web stiffeners are used the design shear resistance of a column web should be determined according to EN 1993-1-1. 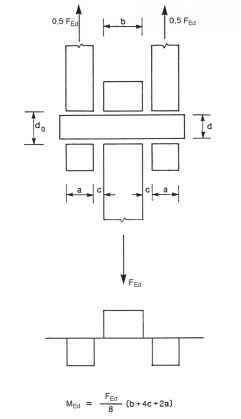 NOTE: In double-sided beam-to-column joint configurations without diagonal stiffeners on the column webs, the two beams are assumed to have similar depths. (6) Where a column web is reinforced by adding a supplementary web plate, see Figure 6.5, the shear area 6vc may be increased by bs twc. If a further supplementary web plate is added on the other side of the web, no further increase of the shear area should be made. (7) Supplementary web plates may also be used to increase the rotational stiffness of a joint by increasing the stiffness of the column web in shear, compression or tension, see 6.3.2(1). (8) The steel grade of the supplementary web plate should be similar to that of the column. (9) The width is should be such that the supplementary web plate extends at least to the toe of the root radius. (10) The length Cs should be such that the supplementary web plate extends throughout the effective width of the web in tension and compression, see Figure 6.5. (11) The thickness ts of the supplementary web plate should be not less than the column web thickness twc. (12) The welds between the supplementary web plate and profile should be designed to resist the applied design forces. (13) The width bs of a supplementary web plate should be less than 40s ts. (14) Discontinuous welds may be used in non corrosive environments.